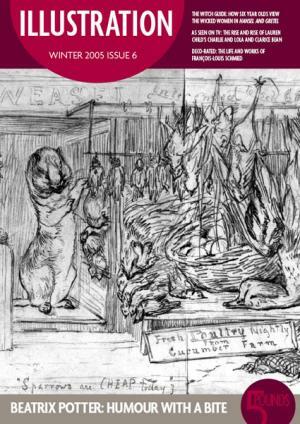 In this issue we learn from the work of a master when we look at the painstaking preliminary sketches of Beatrix Potter and find out how they informed her books and her humour (page 12). But we also find that traditional skills are alive and well in the work of author and illustrator Lauren Child, who, while using an excitingly broad variety of media in her books, warns that computers should never be used to replace vital techniques (page 22). We see that the old fairy tales still compete with the thrills of videos and computer games when we look at the responses of six-year-old children to modern versions of Hansel and Gretel (page 18). They prove that we are still producing illustrations for the oldest stories that are as capable of inspiring fear, horror and laughter as those of previous generations.